The Oncology Nurse-APN/PA spoke with Tonya Edwards, MS, RN, MSN, FNP-C, who discusses how The University of Texas M.D. Anderson Cancer Center focuses on counseling and supporting patients with cancer who receive opioids for pain relief. 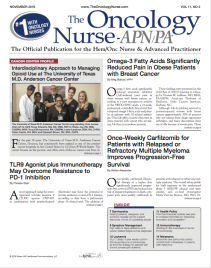 The November issue of The Oncology Nurse-APN/PA (TON) is packed with important news and insights for today’s oncology nurse. In the CHAMPION-1 study, patients with relapsed or refractory multiple myeloma and 1 to 3 previous regimens who received once-weekly carfilzomib had a 77% overall response rate and a median PFS of 12.6 months. Omega-3 fatty acids significantly reduced aromatase inhibitor (AI)-induced joint pain in obese women with breast cancer, according to a new retrospective analysis of the SWOG S0927 study, a 24-week, randomized, controlled clinical trial that compared omega-3 fatty acids and placebo in patients with AI-related arthralgia. According to Ann M. Berger, PhD, MSN, APRN, AOCNS, FAAN, Professor and Dorothy Hodges Olson Endowed Chair in Nursing, College of Nursing, University of Nebraska Medical Center, Omaha, there is an urgent need for further research in this area to alleviate these symptoms and enhance quality of life among survivors of all types of cancer. Recent surveys have revealed that up to 25% of patients with cancer take some form cannabis, but oncologists and other medical providers are often unaware that their patients are using medical or recreational cannabis. Stockholm, Sweden—In older patients with chronic lymphocytic leukemia (CLL) and comorbidities, the use of immunotherapy with obinutuzumab (Gazyva) plus chemotherapy with chlor­ambucil (Leukeran) as front-line therapy was supported by the findings of the CLL11 clinical trial final analysis. Biosimilars are crucial for improving patient access to biologic drugs at an affordable cost. Biologics are now key in the treatment of cancer and autoimmune conditions. But cost remains an obstacle to access to drug therapy. Learning how to activate and harness the immune system—the body’s built-in defense against disease—has brought the field of oncology to the cusp of a cure for at least some, if not many, types of cancer, according to an international authority in immuno-oncology.